My love story with London began in 1999 at the tender age of 14 when I visited the city for the first time on a school exchange. Coming from a very rural countryside of Germany into the “big smoke” was going from one extreme to the other – I was simply blown away by London’s charm and vibrancy. It was everything I’ve ever dreamt of and more: there were theatres, restaurants, museums, libraries, cinemas, shopping at your doorstep, the people and the constant impulsive energies never seemed to stop. It was on that school trip that I realised I needed life around me in order to feel alive – it felt inspiring and as if I had woken up from a dream. From that moment on I knew that I wanted nothing more than to get out of my small-minded town in Germany and demand more from life. Fast forward a few years to my A-Level graduation and it was all set in stone that I would go to London to attend a private language school. Over the years the desire manifested and stayed persistently with me so, in 2005, I finally moved. Though it was only temporarily, I felt that I had made the right step into a great future. London was still exciting and I’m grateful for the friendships I made, mainly with internationals and the experience bonded for a lifetime. Sadly, after my course had finished I had to return to Germany to start uni and finish an English language degree. The years to follow were marked by working hard to shape my academic career but I never lost touch with London. I regularly returned to roam its streets and explore new areas to add to my personal London map so soon I knew the city and its secrets inside out. No matter how often I kept coming back discovering new sides of the city, I died inside when I sat on the plane back home. The romanticised version I kept of London ever since my first visit was stronger than ever and I knew I wanted to be here – ideally forever. Fast Forward another few years, a finished degree a broken relationship and basically cutting all ties with Germany, I landed a job in London – Day X in 2015 had arrived for a life change I had been craving and worked towards for years. So, how do I feel about all of this now looking back? Well, I’m no longer 14 anymore and though dreams are wonderful and you feel like on top of the world once you’ve accomplished them, the harsh reality brings you straight back to earth sooner or later. 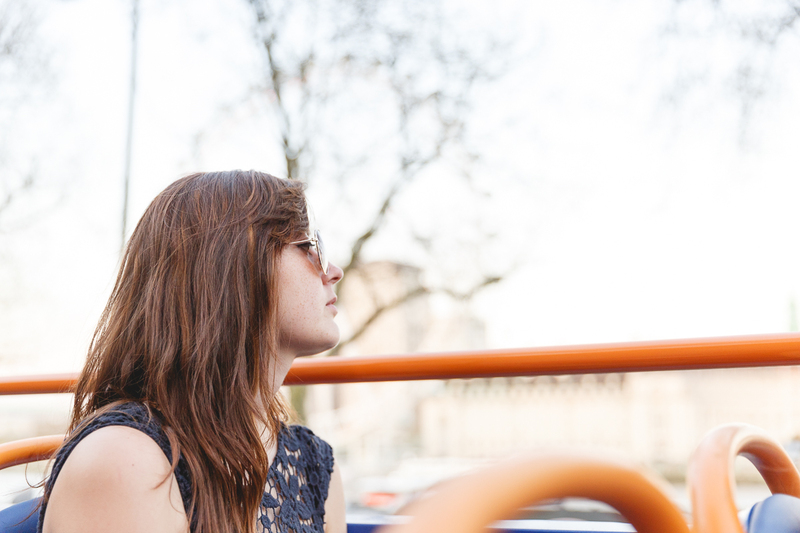 The initial love and admiration have slowly turned into frustration and annoyance – finding your place in London is tough. I live in zone 3 because the central zones are heavily polluted and finding a nice home to live unless you’re willing to call it “your place to sleep only” is worse than finding a needle in the haystack. London is expensive. No matter how hard you work your salary will never be enough to put a pound or two aside. You simply work in London to be here, nothing more. I’m fed up of all the long distances, the many people that squeeze in the morning onto tubes and on trains. Don’t get me started on jaywalkers and tourists! Everyone seems to rush aimlessly around chasing something that’s hard to define and explain – and I feel I’ve become part of that. I no longer have time for my hobbies, my 12h day is filled with a 2h commute back and forth working for 8.5h and then socialising after work because you never know when that connection will prove itself useful in future. Sometimes I’m so busy, I don’t even have time to go to the bathroom or take my 1h lunch break. I have to organise all my life admin either in lunchbreak or somehow after work. I have no idea how I do it, but I keep rotating, and somehow it still works. At night, I often can’t sleep because I worry about life, the people I care about or simply what it is that keeps me here in London after all. It’s draining and exhausting and I have no idea where I keep taking the energies sometimes from to keep going. I just do. So when Megabus invited me the other day to join them alongside other bloggers for a private event* I felt like a long overdue “Me Time” break was needed. It was a lovely warm April evening and I left work a bit earlier than usual as I wanted to make sure I can stroll over to the London Eye without rushing for once. It was a gorgeous evening, one of these very early warm spring days, with people out and about and truly enjoying themselves. 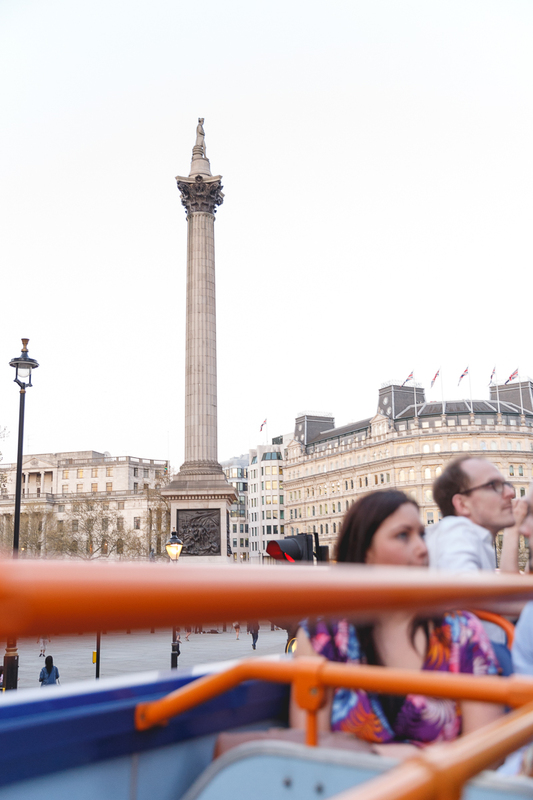 I arrived at the wheel for 5:30pm as Megabus treated us to a private capsule with drinks and stunning views over London. I’ve been on the Eye a few times, but it is each time a wonderful experience. 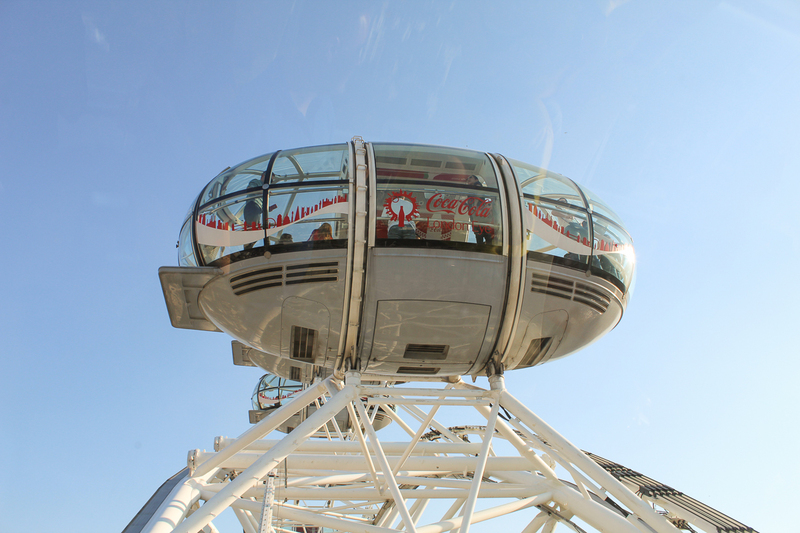 The wheel rotates very slowly so each round takes approximately 30-40minutes with a little break on the very top to take in all the 360-degree views of the city. The weather couldn’t have been any better for this. You could see for miles and the city seemed to glow in the evening light against a bright blue sky. I felt suddenly that all the pressure had been taken of me and I could just be in that capsule, watching life go by 135 metres beneath my feet – take me away yes, please! After the trip on the Eye, Megabus had another treat for us waiting around the corner. 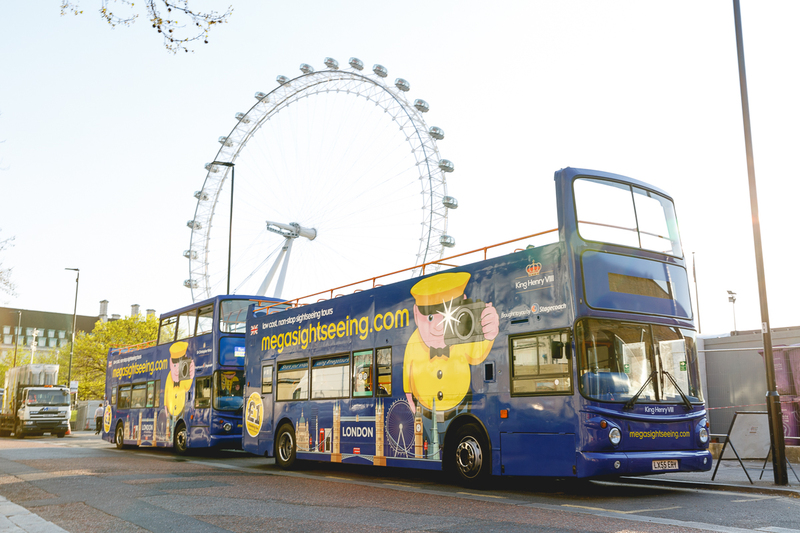 The company have introduced a new open bus fleet to provide city tours in Cardiff, Bristol and London. 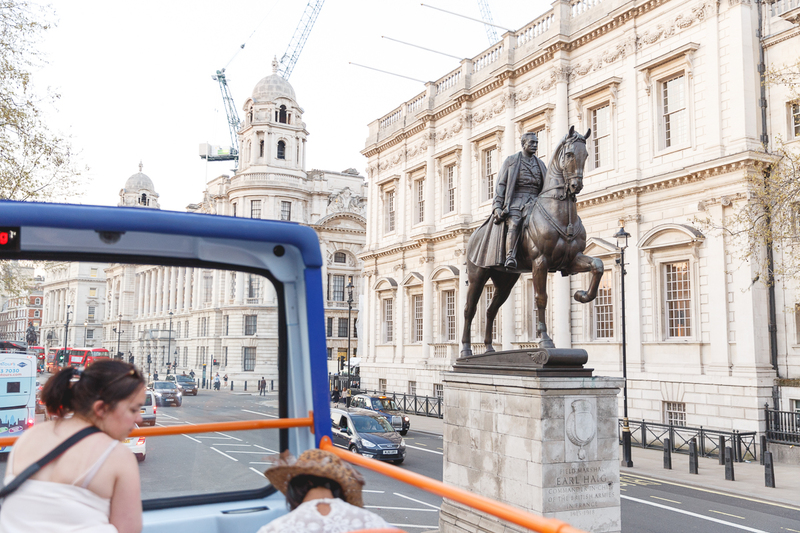 As one of the first to experience the brand new tour, we boarded the top of the bus and got treated to a 2h drive around London. 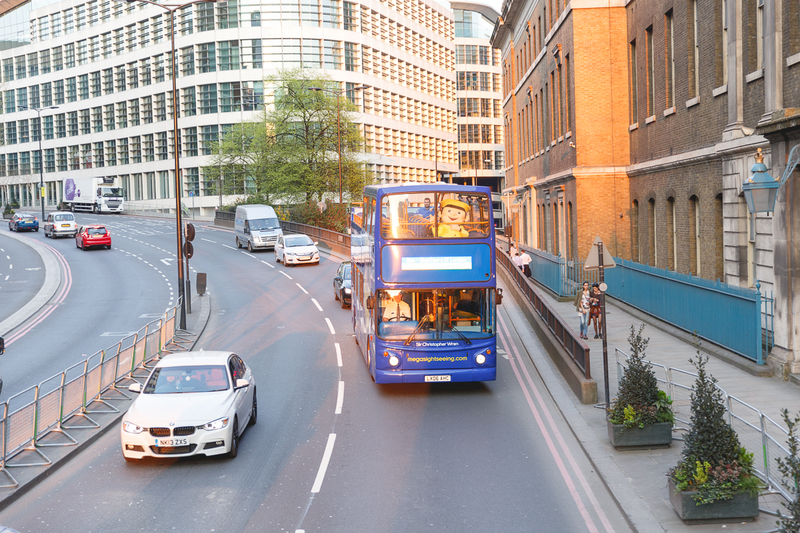 Starting at Waterloo, we headed over Waterloo Bridge down Fleet Street towards East London. I can’t stress enough how perfect the evening was for this, as it was so warm sitting on top of the bus felt like you were on a summer holiday. Everyone sat back, relaxed and enjoyed the views. I couldn’t help it but my mind wandered off a few times. Now and then Megabus provided some information of the passing sights but I never felt disturbed in my personal daydream nostalgia trip. I can’t even tell you when it had been the last time that I was a tourist in my own city. 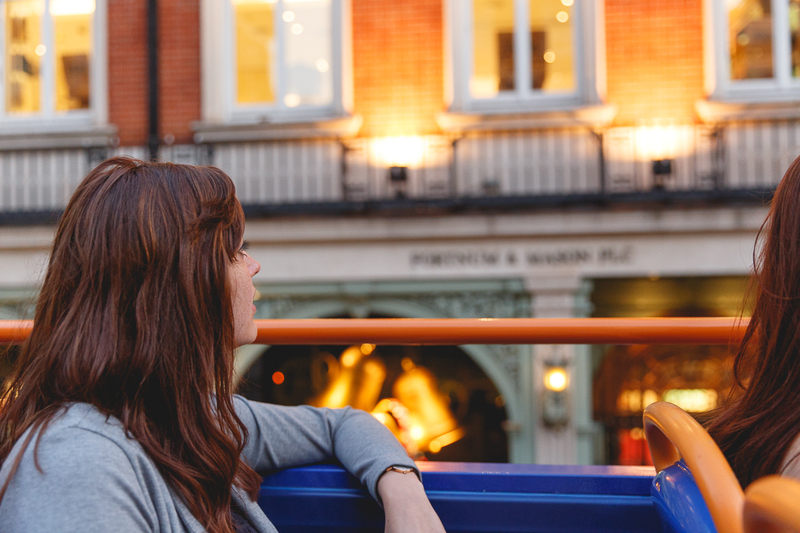 I’m usually so fed up with London its long waits to be seated in restaurants or booking theatre tickets months in advance, that I try to avoid the city as much as possible – but during the tour I felt so relaxed that I had time to reflect on a couple of things why I’ve fallen out of love with London. I’m so absorbed in my own little everyday bubble that I keep forgetting why I loved the city in the first place. 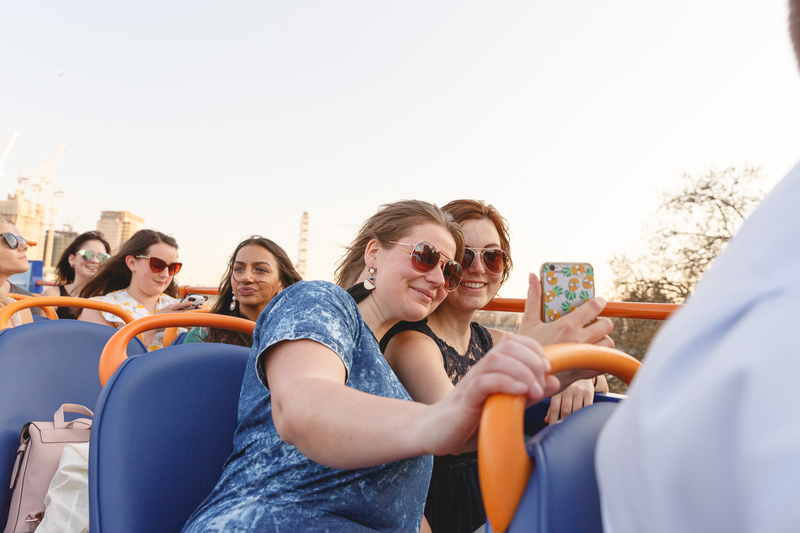 Being on top of the bus, I was seated in a higher position than usual and I could see more details of the incredible architecture that combines modern and ancient tradition. Especially the area around Fleet Street, London’s former press and centre of journalism has beautiful houses and facades. It’s the small details that I kept forgetting and loving about London. The tour headed over London Bridge and returned back to the city via Tower Bridge. Whilst passing over, we were able to see a beautiful sunset over the city. It was still warm and the soft summer breeze that occasionally blew around my nose felt comforting and pleasant. Passing Tower Hill down to Bank, the tour took us to the west side of London along Westminster, Trafalgar Square, down Piccadilly Circus to Hyde Park and back to Waterloo via Victoria. Seeing London’s casual evening vibes slowly turning into a vibrant city at night with all its beautiful city lights reminded me of my 14-year-old self, who was totally overwhelmed by all the impressions when she visited the first time. There is beauty around every corner but we’re too busy to hold still for a moment and to look closer. 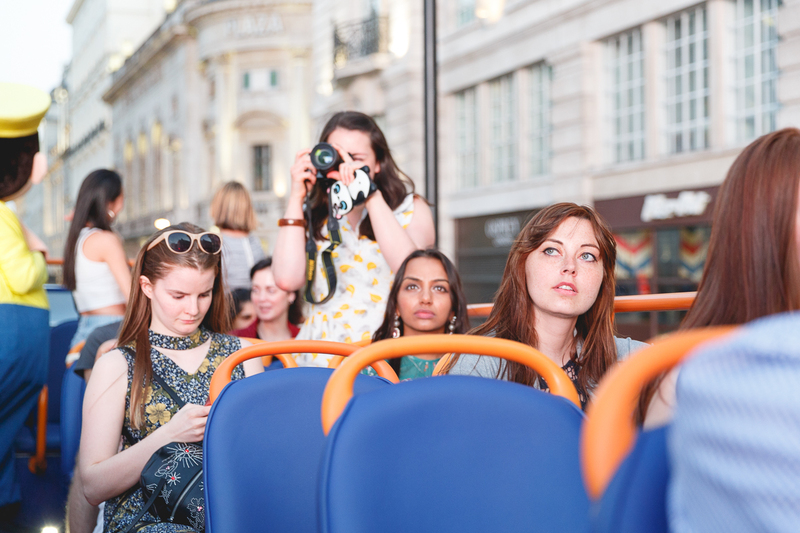 Taking a step back and watch London pass by without being an active participant of it felt good – I needed that break and given the fact that the Megabus London sightseeing tours start from £1 onwards, I can see myself doing this again maybe with friends and family when they will come to visit. I guess as it is with every relationship, once the honeymoon phase is over it’s more about the actual work that we have to put in. We need to appreciate the small things of it and not get side-tracked by all the bigger things that seem to not work out. It’s in the detail and to appreciate it whenever we can to not get lost and I think this is what has happened to me and how I feel about London. Yes, I still hate its loud and smoggy atmosphere and I loathe the commute, always surrounded by people and never really having a moment to myself. But knowing that there is something that only London can give me – a career perspective, a city with endless opportunities and most importantly a place where I for once in my life have true friends, is something that’s worth staying here for. And it is that certainty, whether I want it or not, that I need you to breathe.